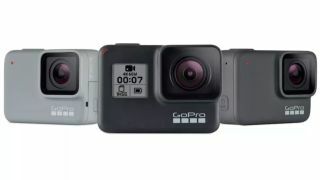 GoPro decided not to wait for Photokina 2018 to announce the GoPro Hero 7, which offers a number of new features for the action-cam crowd to get stuck into. While not much has changed when it comes to the hardware side of things - it’s packing the same 12MP CMOS sensor, GP1 processor and 2-inch 16:9 LCD screen - there’s been a number of changes to the software that will no doubt enhance the shots you take on it. Here’s 5 things you need to know about what's shaping up to be one of the best action cams. Well, GoPro would say that about its latest release wouldn’t it? But this time it’s not just PR bluster. The GoPro Hero 7 Black has a number of new features that set it apart from the pack. GoPro is calling its latest cam the “Hero 6 on steroids”, which is quite a statement given the success of its previous model. The features it has enhanced include a new best-in-class images stabilisation system, live streaming capabilities and a brand-new UI. The GoPro Hero 7 offers a new type of stability to shots that it believes will offer some of the most stable shooting around. This technology has been badged HyperSmooth and it’s a heady mix of software and hardware that combines to offer up stable shots that works even in 4K, 60p shooting. The idea being that you can banish the gimble to the dusty drawer that usually houses your cable collection. Everyone wants to be a YouTube star nowadays, so it makes sense that the new GoPro Hero 7 Black offers live streaming capabilities, at 720p output. This won’t actually work with YouTube at launch (boo) but that integration is coming, as is Twitch and Vimeo. You will be able to show off your live streams on Facebook, however. This footage will also back up to the cam’s microSDHC/SDXC card slot. Two other new features that are set to make your GoPro shots better are the introduction of SuperPhoto, which will automatically reduce noise in shots and will add a HDR sheen to your footage, if the GoPro reckons the footage is in need of that type of makeover. Then there’s a New TimeWarp video option which allows you to do timelapses even when there’s movement in the shots. So, you can ditch the tripod and still show off your hyperlapse skills if you so wish. Oh, yeah, how can we forget about being the millionaire bit of the our attention-grabbing headline. Well, GoPro has revealed something called the Hero7 Black Million Dollar Challenge. This is a contest where you basically have to create your very own hands-on of the device, in the hope of winning a share of a million dollar prize fund. The GoPro Hero 7 release date is 27 September and will cost £379/$399. It’s also available in Hero7 Silver and Hero7 White options, with slightly reduced specs, for £279 / $299 and £179 / $199. The best camera phones that need to be in your pocket.